Three men were arrested on a variety of drug charges by the Cannon County Sheriff's Department on Hollow Springs Road in Bradyville. Charged were Sterling Parker Jr., Robert Lloyd Lyle and Benito Melendez-Rodriguez. Acting upon a tip, Investigator Brandon Gullett obtained a search warrant which was executed by Gullett, Sheriff Darrell Young, Investigator Anthony Young, Sgt. Seth Perry and Deputies Jimmy Hayes and Jordan McGee. Gullett and Hayes made entry to the back door of the house, while the other officers searched a shop on the premises. The officers heard a toilet flush and discovered Parker inside the bathroom and detained him. Lyle and Rodriguez were discovered in the shop beside the home. Both men were detained as well while deputies began their search with a K-9 drug-detecting dog. The dog immediately made a positive alert on an area next to a fish tank in the rear of the house and then headed into the kitchen. "I then opened the cabinet door and observed a yellow and black glass pipe with burnt marijuana residue in the bowl," Gullett reported. The dog then alerted to a locked bedroom, which was identified as Lyle's room. Lyle unlocked the door and the K-9 made a positive alert on a brown wooden dresser. Bundles of clear baggies were discovered along with a synthetic urine kit. Meanwhile, Sheriff Young continued a search in the kitchen area of the home. A silver grinder and a set of scales made to look like a smart phone were discovered. The search continued in the shop next to the house. A blue pack was found under a wooden book shelf that contained four baggies containing a white powder substance. A black bag was then discovered and among the items found inside were several baggies of a green leafy substance believed to be marijuana. "A large compressed block of a green leafy substance" was also found. A search of Lyles uncovered a small silver container that contained two white and two purple pills. The purple pills were identified as Morphine, Gullett said. 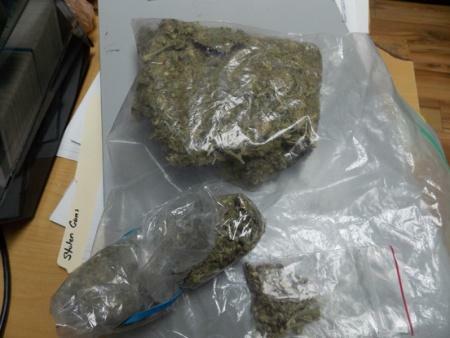 Officers discovered a pack of cigarettes on Rodriguez's person that contained marijuana.